I know I have been living under a rock. I recently came into contact with the authors of some of the most amazing food blogs. Where have I been all these years while they have been cooking and baking the most fabulous food around the world?? Alas, it’s not too late. There is hope for my family, friends, and for myself. One of these fabulous and very talented food bloggers is Jamie from Life’s a Feast. Jamie has been living in France for the past 20 something years and blogs about her life and her food. I am a huge fan and am grateful that our paths have crossed. Jamie recently baked a Plum Brioche Cake . 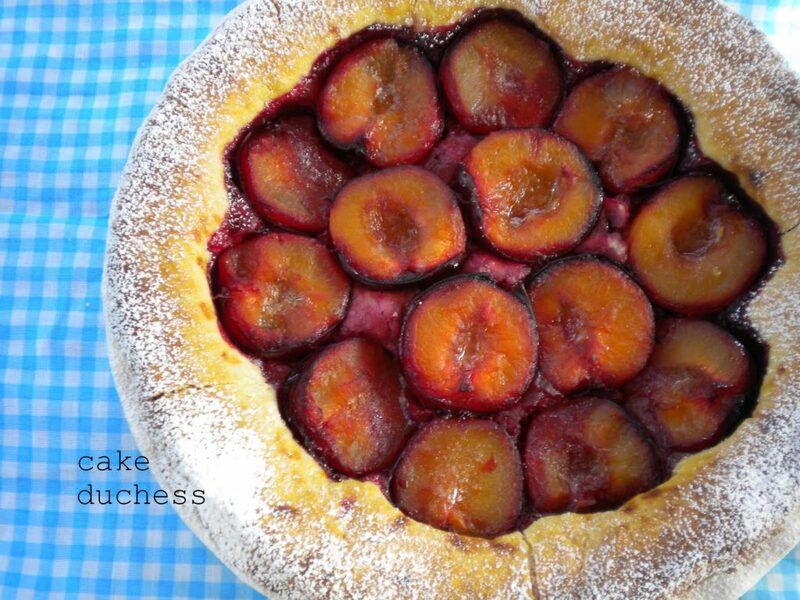 I couldn’t get the image of the juicy plums sitting atop a fluffy brioche cake out of my head. I had to make this cake and I had to make it fast. I love the brioche recipe. It is easy to make, but requires a little patience. Brioche needs to rise and this cake has to rise three different times. When I look now at Jamie’s photos again I realize mine didn’t rise up as much as hers did. I will be baking this beautiful cake again soon and will see if I need to let it rise a longer than an hour during the first part. I used to have a fear of making any thing with yeast. Then I learned how to make pizza. And now I know how to make Gâteau de Quetsches. And you can too. Take a look at Jamie’s blog to see her spectacular photos that explain the recipe in great detail. While you are there, look at her other superb creations. Warm the milk for 5 to 10 seconds in the microwave. Pour the warm milk over the active dry yeast and ½ teaspoon of the sugar, which have been put together into a small bowl. Allow to proof, about 15 minutes, until there is a fairly thick head of foam. Place the flour, the rest of the sugar and the salt in a large mixing bowl; stir to blend. Add the soft butter in cubes. When the yeast is proofed, pour it over the flour/butter in the bowl. Whisk the eggs until blended, add the vanilla and add this to the mixing bowl. Using a wooden spoon, fold the wet ingredients into the dry until all of the dry has been moistened and then begin to stir vigorously until all of the butter has been well blended into the batter and no large chunks remain. You will have a very thick, very wet batter-like dough. Generously flour a work surface and scrape the dough out onto the surface. With the help of a dough scraper, begin folding and kneading the dough, adding more flour as you work and scraping up the dough off of the table, and knead until you have a soft, silky smooth homogeneous dough, adding only enough flour as needed to hold it together into a smooth dough. Knead for 6 to 10 minutes. All of the butter will have been incorporated. Lightly grease a clean, medium-sized mixing bowl. Place the ball of dough in the bowl, turning to coat with the grease. Cover the bowl with a sheet of plastic wrap and then a clean kitchen towel and leave to rise at room temperature for 1 hour. It will almost be doubled. Remove from the bowl and wrap in plastic wrap (allowing enough plastic for the dough to rise and not burst out of the seams of the wrap!) and allow to rest and continue to rise in the refrigerator for 1 more hour. Meanwhile, wash and dry the plums. Slice each plum in half lengthwise, remove and discard the pits and place the halves in a bowl. Toss with 1 teaspoon of vanilla sugar. Toss the plums occasionally while waiting for the dough; this will toss and coat the fruit in the melted vanilla sugar. Butter the bottom and sides of a regular 10-inch (26-cm) pie plate. After one hour, remove the dough from the fridge, take out of the plastic and place on a floured work surface. If you want a thinner brioche layer simply cut into two even pieces, wrap up one half and store in the refrigerator (to use within a day or two) or the freezer. Roll out the dough into a circle just slightly larger than the circumference of your pie plate. Gently lift the dough and place it in the buttered pie plate and pat it out evenly, pressing up a slight edge all around the outside. Brush the entire surface and edges with the beaten egg. 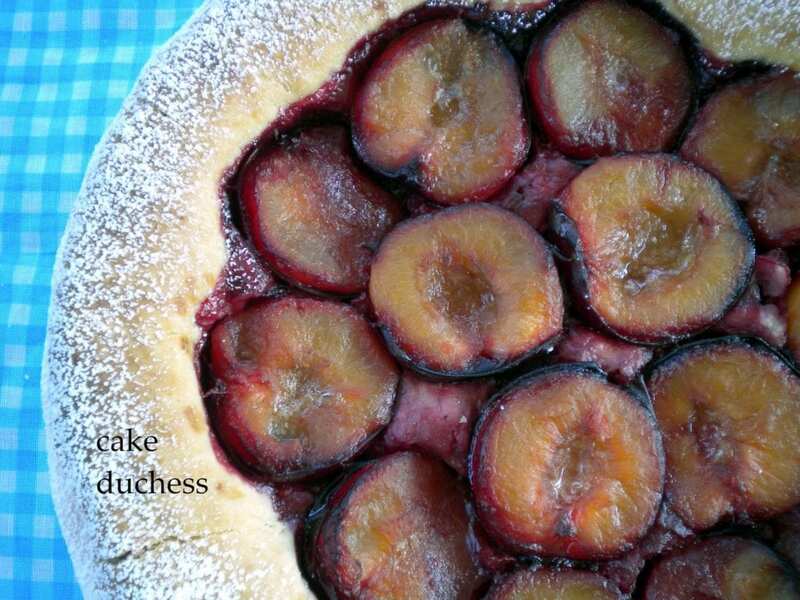 Place plum halves, cut side up, in a rosace design all around to cover the surface of the dough, snuggling them closely together, leaving the edge free. Once they are all well placed on the dough, gently press the plums down into the dough a bit. Cover the cake loosely with plastic wrap and allow the dough to rise yet again for another hour. At the end of the hour, preheat the oven to 410°F (210°C). (*I will bake this next time on a lower temperature. I think with my oven it would’ve been better at 375 F). It is better to slightly undercook this cake rather than risk overbaking – it is a very light dough, less moist and dense than a brioche, so there is always the risking of drying out if overbaked. Did you use those big luscious red plums? Love them! This turned out so beautiful! Like any cake, it always must be baked once to get the feel of it then a second time to get exactly what you want. I do that! But it sounds like it came out perfectly! I too am so glad we met – thank heavens for twitter! The magical world of internet and the amazing people who food blog! Thanks for the shout out here and thrilled you made the cake!